Fans of spinning the reels can hardly complain about the lack of options to choose from. When it comes to slots, there is a wealth of titles to make a pick from as renowned online casino operators have added hundreds of diverse slot games to their gaming libraries. Of course, the slots on offer differ in terms of themes, interface and features, depending on the casinos’ software suppliers, but the rules and gameplay remain the same for the large part. However, some less experienced players struggle to comprehend what the differences between the slots variations are and which types of slots are considered better than others. If you are among those players, reading the following article is a good way to become acquainted with the key differences between the types of slots, available at online casinos. As is the case with most things in life, slots, too, can be categorized. There is a number of ways to categorize slots, depending on their denomination, additional features, the number of paylines and reels. To help new slot players find their way around in the vast jungle of online slot variations, we explore six types of slots they are likely to come across at online casinos. Classic slots are games which incorporate three reels only or three vertical sections that are set into motion whenever the player clicks the Spin button. Back in the day, classic slots used to utilize only lucky sevens, bells, bars, and fruits as symbols. In recent years, however, respected software suppliers have developed a number of modern 3-reel slots which are basically spin-offs of the original one-arm bandits in landbased casinos. Today, classic slots are available in a wider range of themes, and some even offer extra bonus features. Most 3-reel slots typically have a flat jackpot, but it is possible to find classic games with progressive jackpots that increase with each bet players make. One of the greatest differences between classic slots and their more advanced cousins is the number of paylines which render winning combinations. The number of paylines in 3-reel slots is usually limited and ranges between one and five. In addition, classic slots are less graphically advanced than modern video slots with multiple paylines and lack when it comes to bonus features. However, it is possible to find 3-reel titles which incorporate some extra functionalities the likes of the Hold feature and Autoplay, for instance. Some of the biggest software suppliers in the industry have even opted for adding scatter or wild symbols to some of their 3-reel titles. Classic slots will never go out of fashion despite their seeming simplicity. They cater to the needs of players who are aiming for a simplified, clean and dynamic gaming experience. When it comes to coin denominations and bet level, classic slots offer limited betting options, which renders them suitable for players on a budget. Players may notice they tend to hit wins on classic slots infrequently but the payouts are typically more solid. The largest subcategory of online slots consists of games with five reels and multiple paylines. Such titles are often referred to as “video slots”. The multiple paylines are considered one of the biggest advantages of video slots. The greater number of reels makes it possible for software developers to add more potential winning combinations and paylines. The latter no longer stretch across the middle of the reels only, but can run diagonally and horizontally or even zigzag across the screen. The number of paylines on video slots often starts at ten and may well exceed a hundred. More paylines means better chances at hitting winning combinations. Sometimes the lines are fixed meaning that players have to other option but to bet on all available paylines per spin. This renders multi-line video slots an unsuitable option for slot fans with a limited budget. Video slots with five reels and multiple paylines offer far more betting options as players get to adjust their Bet Level, meaning they can choose how many coins to wager per each active payline. Another advantage of video slots results from their advanced graphical presentation. The visuals and animations are usually clearer and more vibrant, while the realistic sound effects further improve players’ gaming experience. Many video slots feature adjustable paylines and allow players to select which lines they wish to bet on. Players who opt for multi-line, bonus slots will benefit from a wider range of extra features. These not only improve their profitability but further add to the excitement of spinning the reels. Multi-line video slots usually have additional wild, scatter and bonus symbols, multipliers of players’ winnings as well as bonus games and rounds of free spins. Wilds and scatters are a favorite of slot fans and serve as a proof not all symbols are created equal. Wilds can potentially substitute for almost all other symbols that land on the reels, enabling players to complete winning combinations that otherwise would have resulted in near-misses. In other words, these lucrative symbols play roughly the same role as the joker card, which helps players improve their hand in some games of poker. The only exception to this rule is that wilds cannot substitute for other specials symbols, like the scatters. Sometimes the wilds can be the key to other great features – in some slots they can unlock rounds of free spins or bonus games. The scatters rank even higher in popularity than wilds, mostly because they are not required to appear on active paylines in order for the player to benefit from them. These symbols pay out as long as a given number of them ends up on the reels. Both wilds and scatters are game-specific so there may be deviations in how they function, depending on the bonus slot one plays. In most instances, scatters trigger additional features like mini games and bonus spins. Sometimes, both wilds and scatters have multipliers attached to them to boost players’ winnings on the last spin by a predetermined amount. Slots in this category often feature additional bonus games designed to make players’ session more fun and challenging. Players are guaranteed to collect additional monetary prizes as long as they succeed in unlocking the slot’s bonus side game which often requires them to pick from different hidden items or spin a wheel. The same applies to bonus slots’ rounds of free spins which allow players to potentially bag more credits without paying for the spins with their own funds. Free spins are triggered by some of the aforementioned special symbols and usually utilize the bet amount the player has used when triggering this feature. On some slots, there is the option to retrigger more bonus rounds as long as players hit the symbols that unlock them during free-spins mode. Bonus games are usually triggered at random by a given number of bonus symbols, scatters or wilds. Players will find 5-reel video slots and their advanced 3D cousins share the same features and gameplay for the most part. There are again lucrative functionalities, the likes of bonus rounds, free spins, wilds and scatters. The key difference here are the visuals and animations. As soon as you load your preferred 3D slot, you will notice right away the unprecedented depth of the three-dimensional graphics. These games rely heavily on immersive animations to attract players, which is why they usually start with animated intros and feature animated clips when players land winning combinations across the paylines. Some 3D titles often have animated reels as well, with characters interacting with one another or even beckoning players to make a bet. Apart from pushing creative boundaries with their 3D slots, software developers aim at introducing players to more elaborate narratives which will keep them engrossed in the games for hours on end. Players are often required to complete different achievements and climb through different levels in order to unlock bonus features and games. On many occasions, players also get to see animated previews of bonus games in order to become familiar with what happens when the feature is triggered. Some 3D slots even allow players to tailor bonus features to their own preferences. Such slots are in high demand among players since they give them a chance to transform their lives all over by collecting a gargantuan amount of money on a single lucky spin. While most video slots offer a fixed amount as their maximum jackpot, this is not the case when it comes to progressive slots where the prize continues to swell incrementally with each wager made on that particular game. A tiny amount is typically subtracted from each player’s bet to contribute to the progressive prize pools and the jackpot’s seed(the base amount the pot is reset to when somebody wins). There are different subtypes of progressive slots as well. Some are linked together in a massive jackpot network which spans across all casino providers operating on the same software. 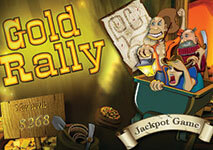 Others have standalone jackpots which accumulate across a single slot, in a single casino. progressives might easily deplete their session bankrolls. As the players’ contribution to the prize pools is practically built into the payout percentages, spins on the progressive slots result in more infrequent regular wins. In other words, variance tends to be much higher in such games. If you lack the bankroll to sustain you through a number of losing spins, you might end up your betting session empty-handed. What is more, players are usually expected to bet the highest amount possible in order to become eligible for winning the handsome progressive prize. This means you need to play at the highest bet level and use the highest coin denomination across all available paylines. If you fail to do that and hit the combination of identical symbols that unlocks the pot, you will not be rewarded with the prize. Some web-based gambling providers link several of their slots in a jackpot network so that the local progressive prize accumulates in one casino, with more than one title contributing to the pot. As was mentioned in the beginning, slots can also be divided into categories depending on the coin denominations players are able to pick from. Thus, slots are classified into two categories, the first one being slots with low coin denominations. This type of games utilizes smaller coin values but other than that, there are no deviations in terms of gameplay. “Why is coin denomination important?”, you may ask. As a general rule of thumb, slots with lower coin denominations usually offer lower payouts as well. Casino operators do not generate that much profit per spin from low-denomination slots, which, in its turn, translates into lower payout percentages and higher house edge, respectively. Such games appear to be suitable for players with limited bankrolls because they bet less per spin and win smaller amounts of money. Because of this, many players prefer to bet on slots where higher coin denominations are available. Such games offer higher value to players whose bankrolls are more impressive in size. Some people argue that it is better to play a few less spins on a high-denomination slot rather than playing more rounds on a low-denomination game since the former has higher flat jackpots and better payouts on winning combinations. This can respectively result in higher profitability for players.